Watering Hole near Yoyogi station is a great spot to try Japanese and imported craft beer. I felt like I was back in the US with the stickers on the wall and refrigerator. The menu is basic, fish and chips, mac n’ cheese, seasonal pickles, and rice crackers. Sadly, I believe the sweet potato chips are no longer on the menu. Bummer. Watering Hole opens from 3 p.m., for those of you who are here on holidays, or if you finish work early. Friendly staff who help answer my questions about the brews. Check their website as they update their beer menu daily. 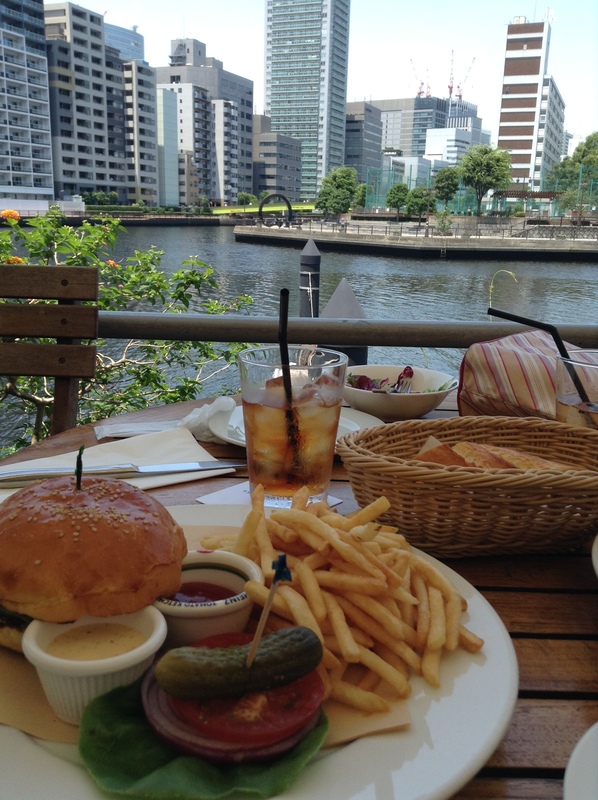 Watering Hole is a short walk from Shinjuku Takashimaya. One of the best curries I have had in a long time was at this German restaurant in Tsukiji. Yes, you read that correctly. A German restaurant at Tsukiji serving curry. But, this wasn’t just any curry. The meat is a German sausage, and for toppings everyone gets a quenelle-shaped German mashed potatoes with house-made sauerkraut. I could eat a whole bowl of the sauerkraut. Onions and cabbage that are lightly fermented. Next time I’ll ask for a double order of it. I also added some pickled jalapenos, not very German, but I never see it on a menu, so I figured, why not? And, the spicy curry had a nice kick to it. Not the family-friendly curry that is prevalent throughout this country. After years of working in the area, it is a big surprise to come across something so unique like this. This is one of the great pleasures of Tokyo. You never know what you will find, and it usually takes you beyond what you anticipated. German pop music (the beat was definitely from the 80s) played on the soundtrack. The walls are lined with German beer ads and photos that were taken from trips to Germany for what look like beer festivals. From the ceiling hang dusty German flags and buxom German beer maid characters, all adding fun character to this tightly packed restaurant that seats a little over two dozen. The lunch menu is curry only. I came just before the lunch rush and most of the diners were obviously regulars. The phone rang a few times with take-away orders as well. Lunch is 890 JPY and diners can choose from the following curries: chicken, beef, sausage, Keema (which says it is the spiciest), and a weekly special. This week it was shrimp. Lunch comes with a free dish such as sauerkraut, sunny-side-up egg, dessert, or orange juice. I would love to come back at night sometime. A cabinet next to the kitchen was filled with German beer glasses. Evenings appear to be more authentic German pub-style cuisine. If you go for lunch, then have your after-lunch coffee at Tsukiji Turret Coffee. At Cicada in Aoyama, near Omotesando, I always order the mezze plate. I love the variety of small bites, often with lots of vegetables. If you have allergies, or prefer for an all vegetable mezze, the kitchen is great to substitute something. I sometimes come by myself and sit at the bar. In New York City I found it very easy to start up conversations with complete strangers, but that is much harder to do here in Japan. However, I’ve met some interesting people here, including a designer. In our conversation we realized that we both worked on the same food project, at different stages. Cicada is that type of restaurant that draws in an international crowd, but also internationally-minded locals. There is always a buzz in the restaurant and the staff speak English. The draft beer is from T.Y. Harbor, their sister shop. The wine list is reasonably priced and there is a nice selection of wines-by-the-glass that match the Mediterranean-inspired cuisine. There is outdoor seating, but that seems to book up quickly, so plan ahead if you want to dine al fresco. ** Note, reservations required. Kotaro is very popular and not many spots open up each month as regulars make their next reservations on their way out. Kotaro is named after the owner and chef who prepares all of the food in an open kitchen behind a large wooden counter. I was introduced to Kotaro by a food writer who introduces me to the best spots around the city. Selection of saké cups on the counter. Each saké is served with a different cup. It’s always interesting to try saké from different cups, and curious to see which ones the staff picks for each person as they are not always the same. Kotaro menu – photo by my sommelier friend, Carrie. Arigato! Kotaro writes the menu by hand. Love this personal touch. The concept behind the saké list is very simple. Kotaro has selected eight breweries that he is fond of and only serves from these eight. When I first heard this I thought it was limiting. However, the brilliance behind this is that as he has strong connections with these breweries he is able to get limited release saké for his restaurant. Many of what we had this evening will be hard to find elsewhere in Tokyo. He also likes the styles of these breweries and his cuisine works well with these. The first course at Koutaro is always a bean dish. Again, very simple concept, but when executed correctly is very rewarding. I also loves the tableware he uses, like this intricate blue and white dish. There is katsuobushi (dried and shaved skipjack tuna) garnishing the beans, greens, and mushrooms. Most Japanese will start the night off with a beer and then move onto saké. At izakaya with a good saké list, I like to start off with a sparkling saké, which Kotaro usually has on hand. 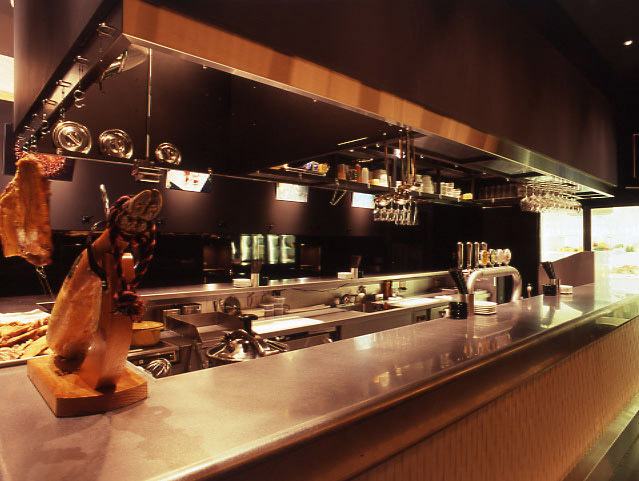 The izakaya has a long counter facing the open kitchen, or if you come with friends you can get a table. The staff speak English and can explain the dishes. The menu is only in Japanese, so I recommend telling the staff, “omakase” (oh-mah-kah-say) and letting Kotaro serve you some of their signature dishes. Tell them if there is anything you like, and more importantly, you don’t like. Basashi (horse meat sashimi) 馬刺し from Canada of all places. Kumamoto prefecture in Kyushu (southern Japan) is famous for basashi and I have become a big fan of it. It’s very meaty and like eating steak tartare. The restaurant is popular so you have to book well in advance. You could call from overseas to place your reservation, about a month in advance. I believe the phone lines open up at 1:30 p.m. The staff can take your reservation in English. Japanese-style potato salad is a common dish found at casual izakaya so I was surprised to find it here at Koutaro. That being said, potato salad is a comfort food that almost everyone loves. And, this one was topped with a smoked, hard-boiled egg. Something I can’t make at home. The dressing is a classic vinaigrette. Menchi katsu is one of Kotaro’s signature dishes. Ground meat that is breaded and deep-fried. Surprisingly very good with a hearty saké. Another tip, ask them to give you different temperatures of saké. It’s fun to try hot and cold and to see how the flavor changes as a hot saké cools down. The last dish is his signature udon noodles that he makes each evening from scratch after the store closes. Kotaro is from Kagawa, on the island of Shikoku. This is the heart of udon country. In Tokyo, most meals end with rice, so the handmade udon noodles is a great spin. He serves a Japanese-style carbonara with a raw egg, butter, and soy sauce. He also does a cold udon noodle simply garnished with grated daikon and soy sauce. It’s usually a young, hip crowd here. It’s always busy. They do serve until late at night, so if you can’t get in early, try and book later in the evening. Closed Sunday and the first Monday of each month. Tokyo is filled with many nomihōdai, all-you-can drink spots. Restaurants offer different set menus with a selection of beverages and a time limit. These are fun gathering spots when getting together with friends. Recently we had a reunion and the nomihōdai restaurants are fun. The staff at the restaurant bring out the different courses while refilling your drink order. These spots tend to be very boisterous. Some have private rooms if you prefer that. 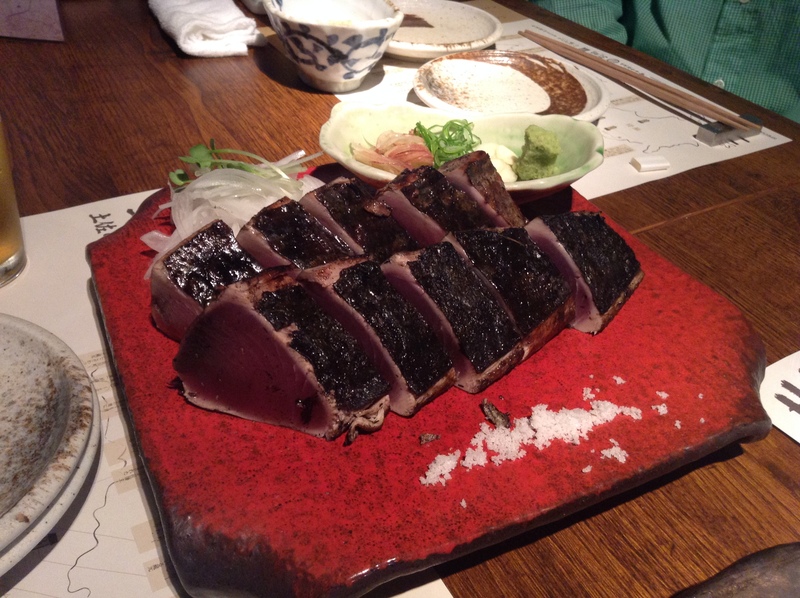 Warayakiya, near Shinjuku station, specializes in seared katsuo, skipjack tuna, seared over straw. Wara means straw and yaki means to grill. Warayaki-ya is a store that grills food over straw. 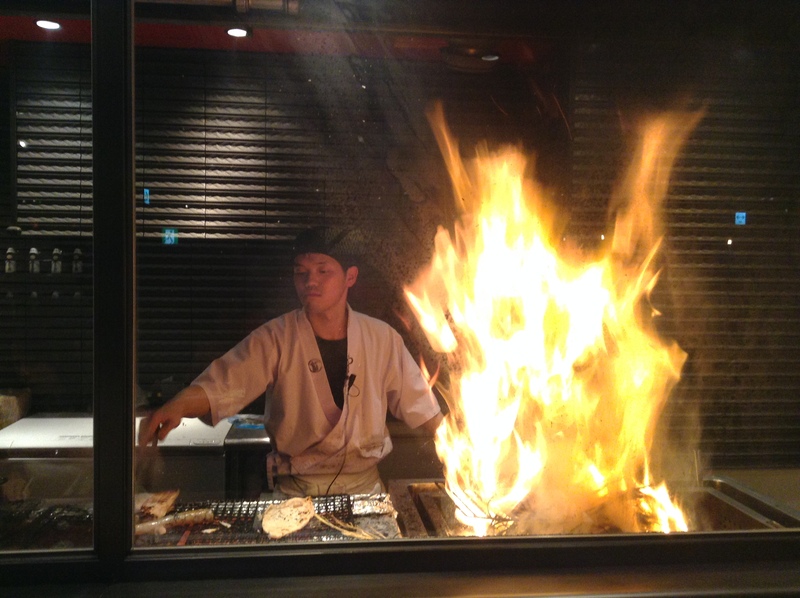 The firing of the katsuo is done behind a glass window. The firing is very dramatic and the smell of burning straw wafts throughout the restaurant. The katsuo is cut extra thick and served with salt instead of the usual soy sauce. Wasabi, ginger, garlic, daikon sprouts, or thinly sliced onions are garnishes that spice up the dish. We did a seven course dinner with beverages for two hours. The usual price is 5,000 JPY but there was a promotion so that the meal was 4,000 JPY. Beverages included beer, shochu, sake, and cocktails. Some of the other dishes included grilled shrimp and tempura sweet potatoes. 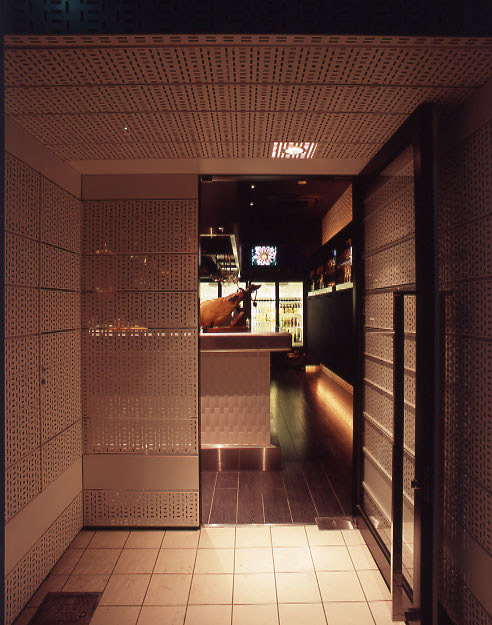 Warayakiya has branches in Roppongi, Akasaka, Ginza, and Shinagawa to name a few locations. For the money it was better than many nomihōdai spots. We enjoyed it and I would go back again. It’s a popular restaurant, so be sure to call ahead for reservations. I love that Tokyo is so big and filled with so many restaurants that new gems keep presenting themselves. 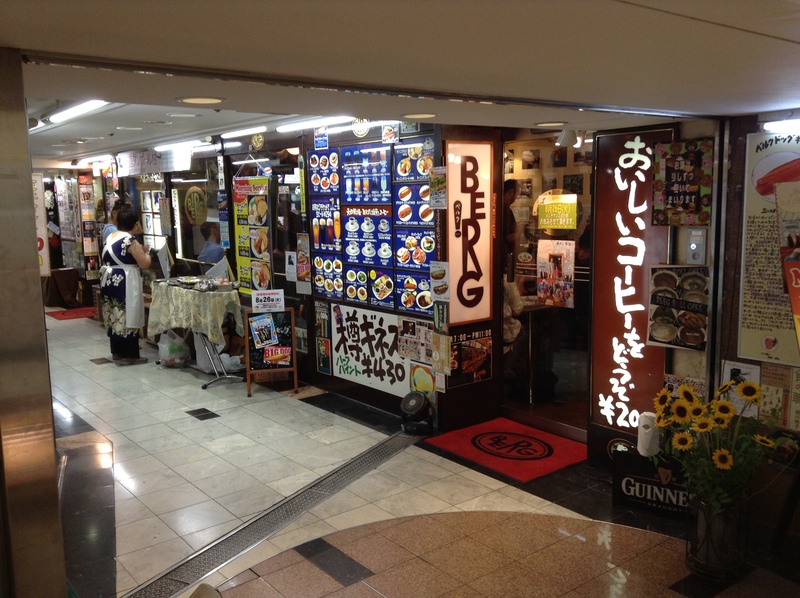 On a recent television program Berg in Shinjuku Station came up as a great B Gourmet restaurant, cheap and delicious. It is open from 7 a.m. and stays open until late at night. It is located just outside of the Shinjuku JR Station’s Higashi-Guchi. Take a left and walk about 15 seconds and it is on your left. This morning at 7:05 a.m. the shop already had about five tables of customers and there was a line at the counter. 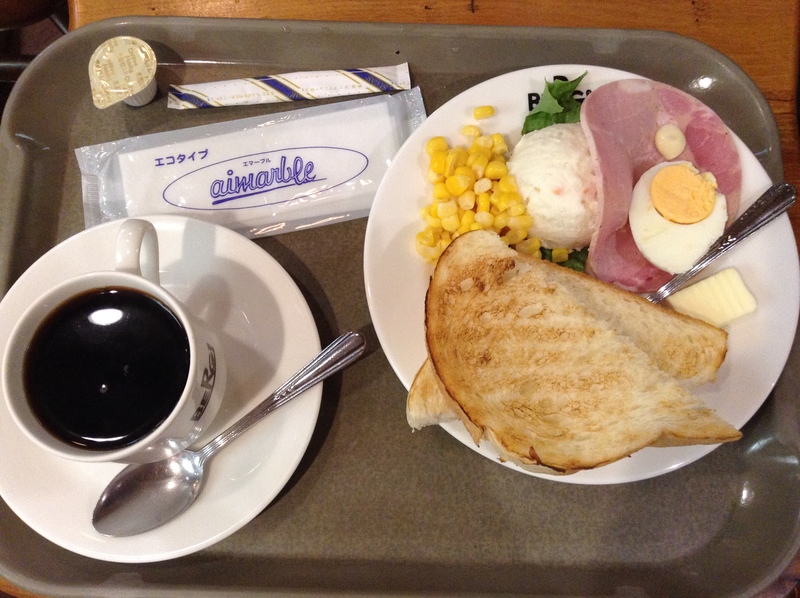 I placed an order for the Morning Plate which comes with coffee and was just under 500 JPY. Can’t beat this. The shop also has many hot dogs and beer on tap. There is a menu of side dishes that includes a cheese plate and other beer-friendly plates. I was so happy to see a poster for Baird Beer’s Rising Sun Pale Ale as the featured Japanese craft beer. Was tickled when a guy who had just finished his breakfast go back to order the Baird beer. If I weren’t off to Tsukiji Market for a tour I would have joined him. Behind the counter were seven staff, all donning denim aprons with BERG stitched onto it and wearing colorful bandannas on their heads. For the life of me I can’t figure what seven people would be doing there. They were all busy and seemed to have some task. A dozen kegs of beer were set off to one corner. A sign that this shop goes through a lot of beer. I will be back, later in the day next time. I hope the Baird Beer will still be the featured beer. I have walked by this shop for years and never bothered stopping by. Glad it’s finally on my radar. Tokyo is a massive city and there are so many parts that I have yet to explore. One of the coolest areas, literally cool as the area is surrounded by canals, is Tennoz Isle. Until now I have only passed through on the monorail on my way to Haneda airport. Now I am kicking myself for not having come much earlier. What a great, quiet oasis in the city. It did not feel one bit like I was in Tokyo. The breeze coming off the water is welcomed in this heat and humidity. I went recently to meet a girlfriend who works in the area to eat at T.Y. Harbor. T.Y. Harbor has been here since 1997 and is a rare microbrewery in the city. I have had the beer at some of the sister shops like Cicada in Aoyama, and its a great craft beer that is very food friendly. I was surprised at how big the restaurant is inside. The outdoor patio seating overlooking the canals is also spacious. We came early to beat the lunch rush, around 11:30 a.m. and already it was almost full on the deck. Service is friendly, the staff speak English, and the menu is filled with great salads, daily specials, and burgers. The daily specials are put online each week. The burger hits the spot for this American. It’s a big burger, meaty, and comes with a generous serving of fries. The brioche buns are made at the breadworks bakery which is located next door. My girlfriend got a big salad that was topped with beets, blue cheese, and chicken. The lunch meal also comes with a bottomless glass of iced tea or Nozy coffee, a rarity in Tokyo, the concept of a bottomless glass of tea. The half-size Caesar salad with avocados is big enough for a meal and is generous with the Parmeggiano-Reggiano cheese. The vegetarian options beyond the salad include a hearty sandwich or a Chana saag spinach and garbanzo curry. There were a handful of tables with small kids and parents and the staff were accommodating. The weekend brunch menu is filled with lots of comfort dishes like pizza, pasta, barbecue ribs, and the burgers. I can only imagine it is a very popular spot on the weekends. T.Y. Harbor is worth the journey. Allow for some time to walk around the canals before or after your meal. A few times during our lunch I told my girlfriend that I felt like I was back in America. Citibank Japan’s office is nearby and there were a lot of workers from the office there. It was fun to be surrounded by so much English. Escape the madness of the city in this oasis near Shinagawa. The weekly menu is posted online. Some of my clients are interested in learning a bit about saké during their visit to Tokyo. However, finding somewhere in Tokyo that serves a wide selection of saké during lunch is challenging. Most of the tours we offer start at Tsukiji Market which is of course only takes place in the morning. Sake no Ana 酒の穴 is in John Gauntner’s great book, The Sake Handbook. And, is conveniently located in Ginza, a short walk from Tsukiji Market. The full menu is available during lunch. This menu features a lot of saké-friendly food. As it is winter that includes fugu kara-agé (deep-fried fugu), salted and grilled buri collar (yellowtail), shirako ponzu (milt), ika shiokara (squid innards), and aji hone-sembei (deep-fried bones of horse mackerel). The restaurant also recommends natto omelet. There is also a nice selection of set menu (teishoku) options which includes soup, rice, and a variety of side dishes. When you arrive, ask for the saké sommelier, Sakamoto-san (sadly, no relation). 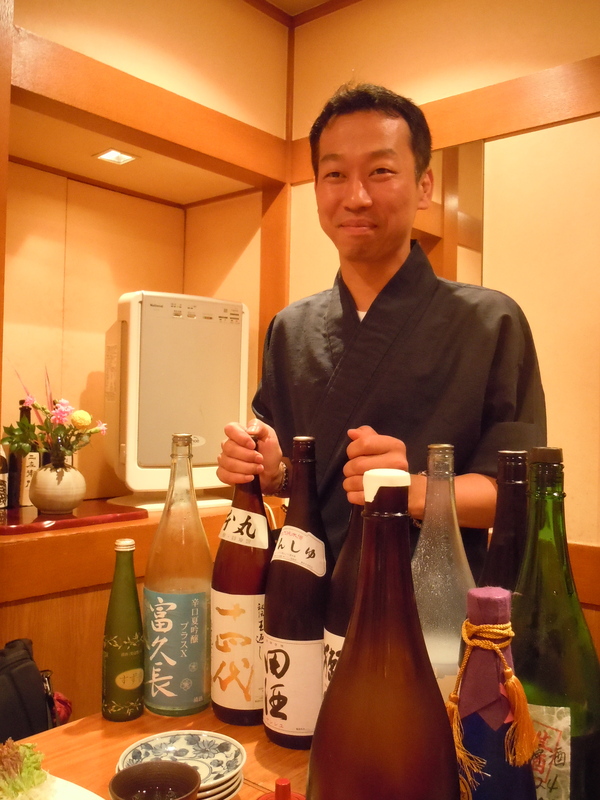 He’s very knowledgeable and will bring out a variety of saké for your group to try. He always introduces a unique and often hard-t0-source saké. Before you leave, be sure to take a look at the glass-doored refrigerators to see the selection of saké here. It is towards the back of the restaurant on your left hand side. Slightly sweet, this unfiltered nigorizaké was the perfect aperitif. It is nama or unpasteurized, so something you’ll only find in Japan. Sakamoto-san said that this Jikon brand is a very sought after label in Japan and hard to find. It is exactly for this reason that I like to come to Sake no Ana. The collection of sake is very impressive. Medium dry, this had a nice acidity to it and a perfect transition from the nigorizaké. As the name says, “karakuchi” is a dry saké and a bit more bold on the palate. 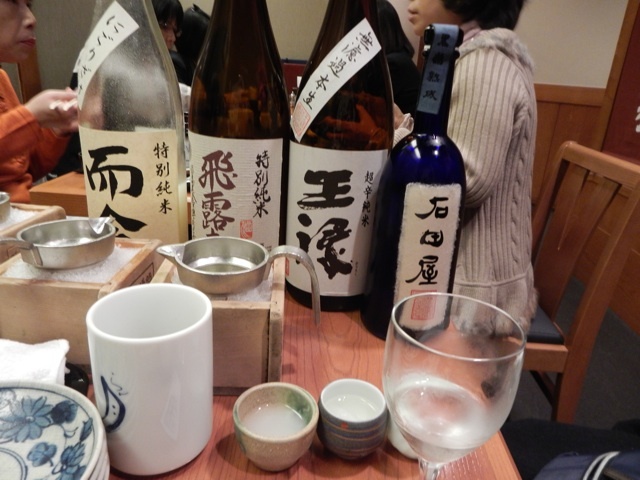 We were discussing koshu and aging saké at the table. Sakamoto-san overheard us talking and brought out this very interesting koshu that I’ve never seen or tried before. It is aged five years and Sakamoto-san said that the emperor of Japan is a fan of this saké. Very rich and impressive saké. Grabbing a drink after work with colleagues or friends in Tokyo is great fun as there are so many options to choose from. These are some of my favorites from Food Sake Tokyo. This friendly tachinomi (standing bar) is located on the back streets of Shinjuku Sanchome. Designed with Showa era items, it feels like stepping back in time. The shop features grilled innards, but you can have some items sashimi style. The brains are creamy and the yudetan (boiled tongue) is tender. If you can, grab a spot at the counter and notice how vigilant the staff is at keeping their cutting boards spotless. You can also see everything that’s being grilled and coming out of the open kitchen staffed with young, handsome men. Near Yoyogi-Uehara station is an upscale izakaya with a great selection of sake in the windowed refrigerator behind the long counter. The menu is diverse, including seafood, and small bites that call out to be had with nihonshu such as nuta, a vinegary miso dressing with seasonal seafood, or grilled ginko nuts. 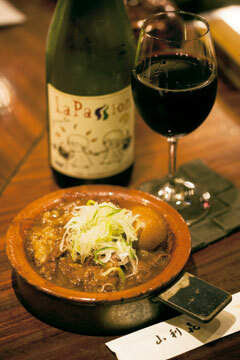 Since 1925, Yamariki has often been ranked as one of the top ten izakaya in the city. Located in the shitamachi district of Morishita, there is usually a line waiting to get in. There is a second shop down the street and the staff will direct you there. Their signature item is a nikomi made from cow innards, port wine, Hatcho miso, sugar, and bouquet garni. The store proudly says that they have been adding to the same nikomi for over 40 years now. The other house specialty is the yakiton or grilled pork bits on a skewer. What makes Yamariki unique is they have a wine list (French only) and a friendly sommelier, Mizukami-san, who will help you match a wine with your food, as well as, of course, sake. The walls at buri are decorated with colorful cup sake from all over Japan. There are over 30 different types of sake served in individual cups. A unique sake to try is the frozen sake that is like a slush. The menu is filled with small plates of sake-friendly foods like seasonal seafood and grilled meats. Maru may be one of the best bargains in the city for standing bars. Located next door to a wine shop with about 200 wines, customers can purchase a bottle and have it opened for drinking at a nominal fee. The first floor is standing only (tachinomi), but if you get there early enough, you may be able to snag a seat in the second floor restaurant. Following the tapas concept, legs of Iberico ham are shaved per order, small plates are to share, and the grilled meats are highly recommended. This shop is in an out of the way area and is always busy with local young hipsters and salary-men from the area. The staff at this fourth-generation shop is very friendly. This article first appeared in the ACCJ Journal. I first came upon this great standing bar about five years ago when it first opened. It had great reviews for being cheap, with great food, and a fun environment. It was exactly that. This is not your typical izakaya with Japanese fare but includes many tapa-style bites. The menu includes home-cured bacon, escargot, smoked butter toast, pork simmered in balsamico, and deep-fried octopus. The drink menu is extensive, including cocktails and whisky, but I stick to wine or sangria as it seems to be the best match with the food. The bar serves seven wines by the glass and is it is a busy place, the bottles are usually fresh. It is only a few minutes’ walk from the station, so perfect to stop by and have a drink and a few small plates if you are in the area.